W.1870 / 3140 x L.2020 x H.660. Day-night upholstered units with removable covers: bearing base with metal frame and wooden slats, wooden panels padded with polyurethane, seat & mattress in polyurethane and anallergic polyester fibre with removable cover. 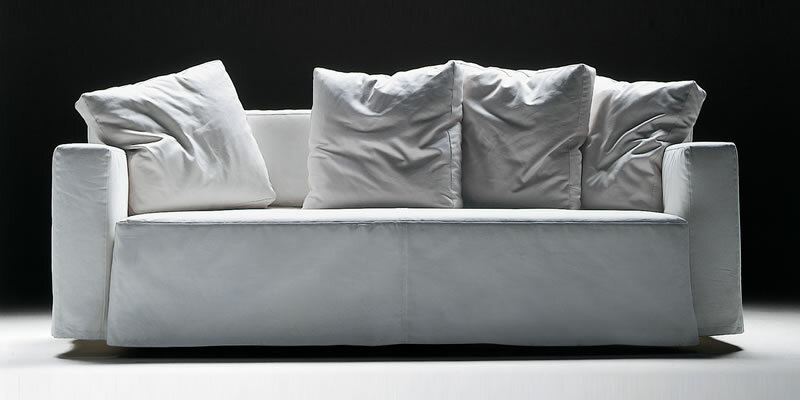 Bed sofa with completely removable covers, non-deformable polyurethane padding. Feet in moka-grey-light stained wood. Seat cushion in polyurethane and reinforced feathers. 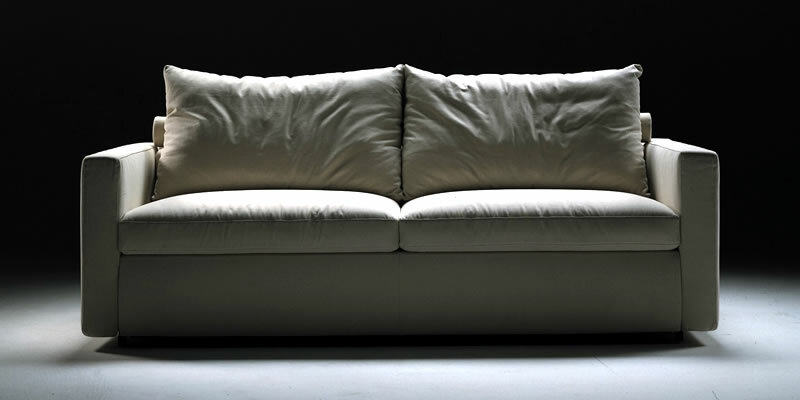 Seat cushions have a "standard" firmness - on request they can be made "soft" or "firm”. Dimension: cm. 215 for mattress cm. 160 x 200. The synthesis of a unique style simply hiding the secret of the metamorphosis. 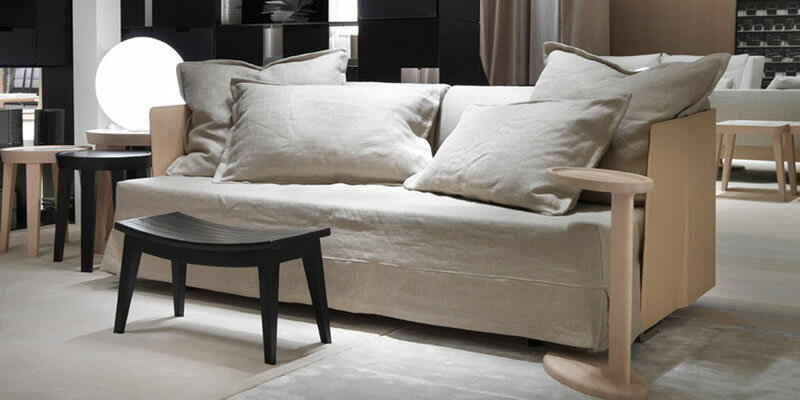 A series of convertible armchairs and sofas with fully removable covering; they are also available in the fixed version or with a metallic container. The structures are made of metallic tubes, springing in crossed elastic belts. The seat and back cushions are made of polyurethane foam covered with a thermal layer. The back and armrests are made of wood and bayonet-coupled. 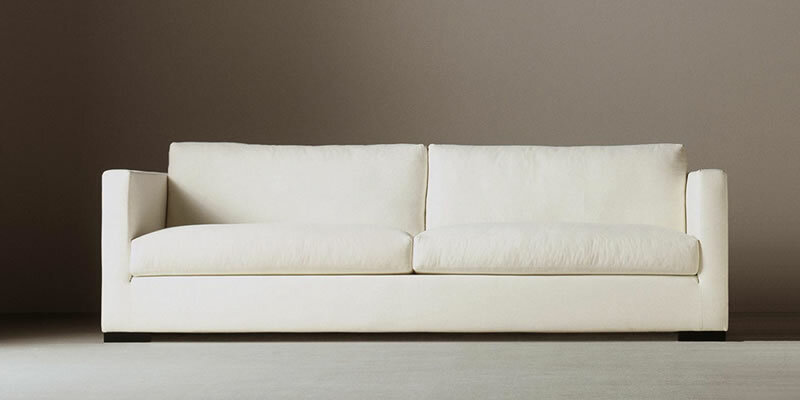 The armrests, available in four sizes, are necessary for completing the sofas. The base element of this modular system, the flexible slatted wood base, can change to perform a number of different tasks through the intelligent use of back- and arm rests; it is a single bed, a double bed, a dormeuse, a settee or twin beds which occupy the space of just a single bed. They can also be fitted with storage drawers which slide under the first bed. 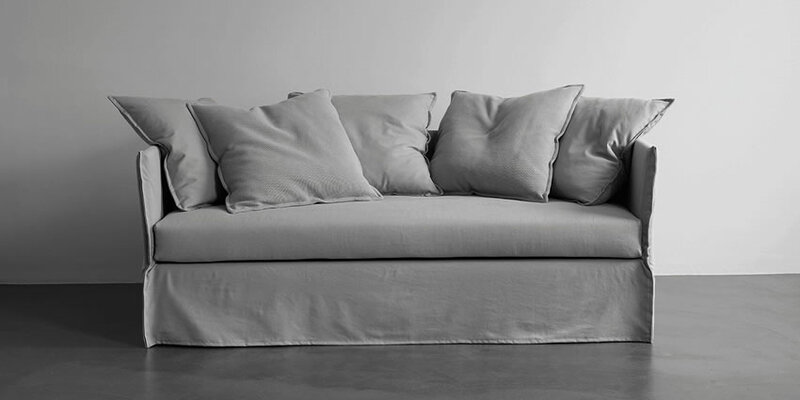 This roomy and cosy sofa bed can be rapidly transformed into a comfortable double bed. The completely removable cover is available in a combination of two different colours of the same fabric which can be freely chosen as per your preference : one colour for the external cover of the backrest and the sides of the seat cover, the other colour for the internal part of the backrest and the upper part of the seat cover. As an alternative, the cover can also be made in one only colour. 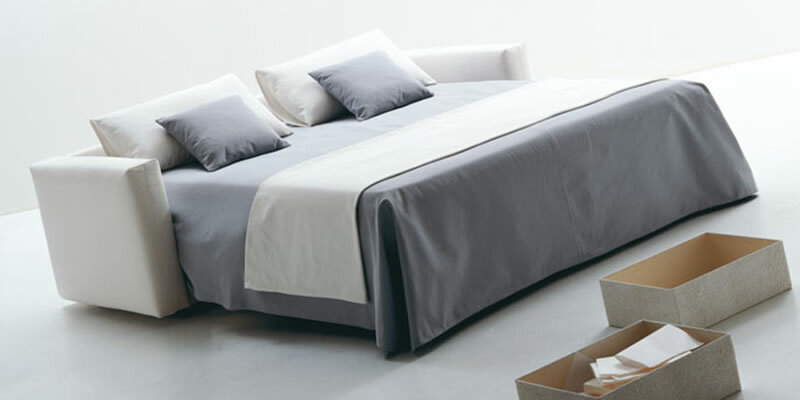 Available with a Memoform mattress or a spring Special mattress that folds and unfolds on the pull-out fixed slats frame.